Thus the Grand Canyon is a land of song. Mountains of music swell in the rivers, hills of music billow in the creeks, and meadows of music murmur in the rills that ripple over the rocks. Altogether it is a symphony of multitudinous melodies. All this is the music of waters. 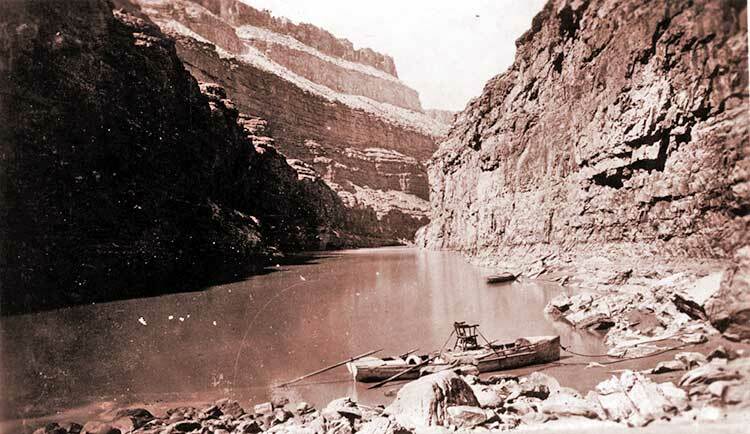 In 1869, John Wesley Powell and nine adventure-seeking companions completed the first exploration of the dangerous and almost uncharted canyons of the Green and Colorado rivers, through the present-day states of Utah and Arizona. In addition to these steep and dangerous river canyons, Powell and his companions faced the relentless and inhospitable conditions of the Great Basin Desert as they traveled from the northeast to the southwest corners of the Colorado Plateau. By this remarkable journey, Powell, a 35-year-old professor of natural history, apparently unhampered by the lack of his right forearm (amputated after the Battle of Shiloh), opened up the last unknown area of the continental United States and brought to an end, the era of western exploration. Today, Lake Powell bears his name. Powell's many explorations of the American Southwest took him and his party through present-day Canyonlands National Park, Grand Staircase-Escalante National Monument, Lake Powell National Recreation Area, Grand Canyon National Park, Bryce Canyon National Park, Zion National Park, Lake Mead National Recreation Area, in addition to Wupatki and Sunset national monuments. John Wesley Powell always maintained he was not an adventurer, nor did he consider himself just an explorer. He contended he was a scientist, motivated by a thirst for knowledge and a firm belief that science was meant to further the progress of humankind. Powell's exploration of the Colorado River led to the formulation of some of the fundamental principles of geology. He went on to develop an understanding of the natural conditions that control society in the arid lands of the western states and to develop guidelines for the orderly development of the region. Powell had a keen and sympathetic interest in the Native Americans who inhabited the Southwest and made fundamental contributions to the new sciences of anthropology and ethnology. He published the first classification of American Indian languages and was the first director of the U.S. Bureau of Ethnology at the Smithsonian. His talent for organization has left its mark on many agencies and programs for the development and conservation of natural resources, including the U.S. Geological Survey which he directed for 3 years. 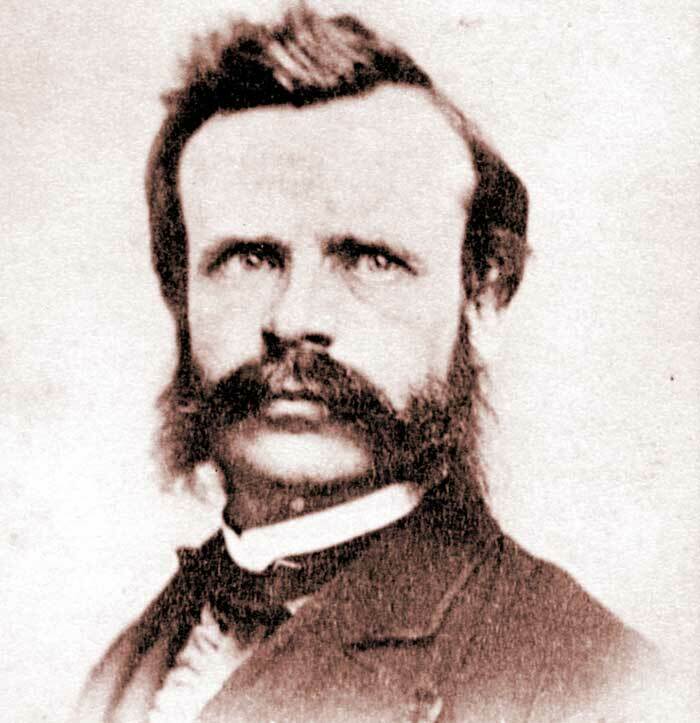 John Wesley Powell was born in 1834 in Mount Morris, New York, the son of Joseph Powell, a Methodist preacher and avid abolitionist. Reverend Powell's vigorous stand against slavery was met with hostility by many of the townspeople. He and his family moved to Jackson, Ohio when John Wesley was a small child. Young Powell was frequently stoned by his classmates and had to be removed from public school and placed under the tutelage of a neighbor, George Crookham, a farmer and self-taught scientist. Crookham emphasized learning nature firsthand, and Powell's interest in natural history grew during their numerous junkets to collect specimens of plants, animals, birds and minerals. When Powell was 12 years old, the family moved to a farm in Wisconsin. With his father away much of the time, the boy assumed management of the farm, an experience that helped develop physical stamina and moral character. Though he attended school irregularly, he was determined to pursue his studies in science over the objections of his father who wished him to become a minister. When he was 18, Powell began teaching in a one-room country school to earn money for college. The next seven years were spent teaching school, attending college, and exploring the Midwest. At various times he attended Illinois College, Illinois Institute, and Oberlin College. In 1858, he joined the newly formed Illinois State Natural History Society, and as curator of conchology (branch of natural history that studies mollusk shells), made a fairly complete collection of the mollusks (clams, mussels, etc.) of Illinois. He began teaching at Hennepin, Illinois in 1858 and in 1860, became superintendent of its schools. While on a lecture tour in the summer of 1860, Powell realized that a civil war was inevitable. That winter, he studied military science and engineering. A strong abolitionist, John Wesley Powell was one of the first to volunteer when President Lincoln issued a call for troops. After the war, Powell accepted a professorship in geology at Illinois Wesleyan University in Bloomington. His method of teaching reflected his training under George Crookham, and he often took his students into the field to collect fossils, minerals, and plants and to observe animals in their natural habitat. The following year he gave a course of lectures at Illinois State University in nearby Normal, Illinois. The State Legislature provided a small endowment for the museum of the State Natural History Society, and Powell was named curator. Powell loved to travel, it had been one of his main interests before the war. In 1867, he led a party of students to the Rocky Mountains to collect specimens for the museum. Funds for the trip came from various sources, including the Museum of Natural History-$500, the Illinois Industrial University (later the University of Illinois)-$500, and the Chicago Academy of Science-$100. In return he agreed to supply them with specimens of the animals, plants, and any other materials collected. Scientific instruments were loaned by the Smithsonian Institution, and Powell agreed to give the Institution the topographic measurements made by his party. He made arrangements to procure rations for the group from Army posts at Government rates and to obtain free transportation from the railroads. Powell contributed his own salary to help finance the trip. In May and June of 1867, the expedition, which included Mrs. Powell, traveled by train, wagon, and horseback across the plains to Denver and on to a valley known as Bergens Park on the west side of the Rampart Range north of Pikes Peak. After climbing Pikes Peak they traveled west to South Park where they camped for several weeks, exploring the mountains and hot springs and making a variety of natural history collections. Most of the group returned east in September, but the Powells and a few others remained to explore Middle Park and the headwaters of the Grand River, as the upper part of the Colorado River was then called. In the summer of 1868, Powell returned to Colorado with his wife and about 20 others, mainly neighbors and students. They collected more specimens for the museum, explored the Colorado mountains, and climbed 14,000-foot-high Longs Peak. In October, the party reached a point on the White River about 120 miles above its mouth where they built cabins and established winter quarters. During the winter of 1868-69, Powell traveled south to the Grand River, down the White and Green Rivers, north to the Yampa River, and around the Uinta Mountains. He befriended a tribe of Ute Indians and studied their language and customs. His interest in the Indians of the West grew, and in 1873, as a special commissioner to the Indians in Utah and eastern Nevada, he pleaded for greater justice and more educational opportunities for the Indians. By 1868, Powell was considering exploration of the Colorado River, undeterred by legends of earlier expeditions that had perished. Lieutenant Joseph C. Ives, who in 1857 explored the southern stretches of the river below the Grand Canyon believed "that the Colorado, along the greater part of its lonely and majestic way, shall be forever unvisited and undisturbed." 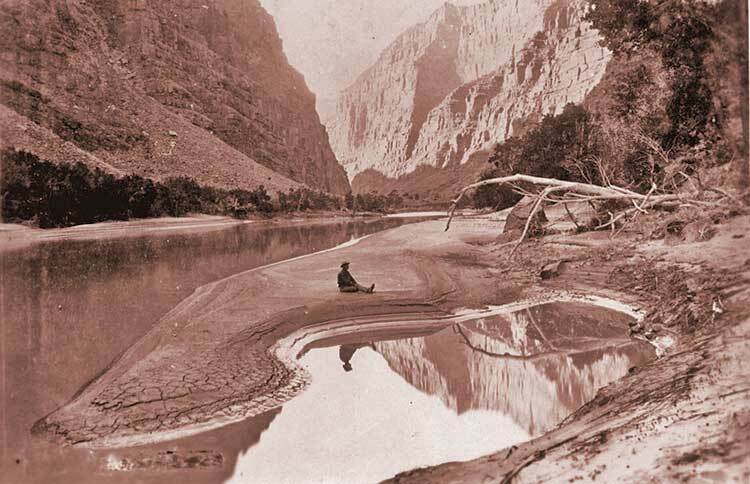 But after studying the few reports, talking with Indians, hunters, and mountain men familiar with the area, and exploring tributary streams similar to the Colorado, Powell decided it was possible to explore the river by descending it in small boats. He obtained some funds from private sources and from the Illinois State Natural History Society, and he gained permission from the Government to requisition military stores. He had four boats built in Chicago to his own design and specifications and had them shipped to the proposed starting point at Green River Station, Wyoming Territory. He selected a crew of nine who, with the exception of his brother Walter, were mountain men experienced in living off the land. On May 24, 1869, Powell launched his boats on their historic journey. Powell's party traveled more than 1,000 miles of river through winding canyons and over foaming rapids. 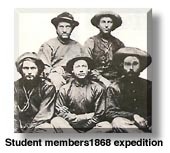 One of the crew left the expedition after a month, having had enough adventure; three others, hoping to find a safer route overland, departed only two days before the voyage ended. Powell and five men in two boats emerged months later on August 30 at the mouth of the Virgin River, Arizona, long after hope for their survival had been abandoned. Their emotional ordeal was well expressed in Powell's words: "What falls there are, we know not; what rocks beset the channel, we know not; what walls rise over the river, we know not." Powell immediately set about making plans for a second expedition. He had planned and supplied the first trip for what he thought would be a leisurely 6- to 9-month scientific expedition. Because of the loss of food and equipment and the scarcity of game, the trip had been hurried. Powell's observations and notes on topography and geology were incomplete or unreliable because of badly damaged instruments. The few specimens collected had been cached along the river. Having succeeded so dramatically in conquering the Green and Colorado Rivers, Powell had little difficulty in obtaining funds from Congress to continue his exploratory work. He decided that supplies should be cached along the river and spent most of the year 1870 in determining potential supply routes and in establishing friendly relationships with the Indians. By the spring of 1871, preparations had been completed for the second survey of the canyon country. This time the party included a surveyor, Professor Almon H. Thompson, Powell's brother-in-law, and an experienced photographer, E. O. Beaman, who together with his successors James Fennemore and J. K. Hillers, dramatically documented the river voyage. On May 22, the party pushed three boats of improved design into the stream. Major Powell rode in the lead, perched in a chair lashed amidships where he commanded an unrestricted view of the way ahead and could signal to the other boats. The expedition was planned to last about a year and a half. During the first 4 1/2 months the expedition traveled from Green River Station to the mouth of the Paria River at the foot of Glen Canyon. Thompson was largely responsible for conducting the exploration of the river. Powell spent most of July and August traveling on horseback between the river and Salt Lake City, exploring the canyon lands, and studying the Indian tribes. During the winter and spring (1871-72) while Powell was in the East seeking new appropriations, Thompson set about mapping the area. In the spring, while seeking another route by which supplies could be brought to the river, the party discovered the last unknown river in the United States and named it the Escalante. In August 1872, the expedition once more started down river from Lee's Ferry. Because of torrential rains and heavy snowmelt in the mountains, the river was high, swift, and dangerous. 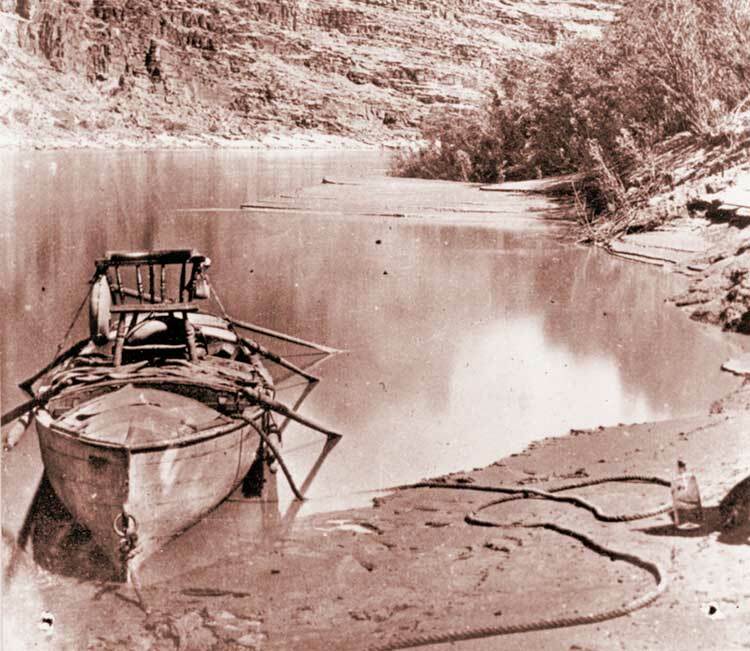 Finding that controlling the boats was nearly impossible in the rushing current, Powell called a halt to the expedition when the party reached Kanab Canyon. The second expedition brought back considerable information. Professor Thompson completed a topographic map of the Grand Canyon region, and Powell's monumental account was published in 1875 by the Smithsonian Institution. Hundreds of photographs were taken, many of them stereoscopic views that brought the western canyons into eastern living rooms. Diaries and field notes were kept by several other members of the party. Dellenbaugh's story of the trip, A Canyon Voyage, was published in 1908, and the Utah Historical Society published the diary of Thompson in 1939 and those of Bishop, Steward, W. C. Powell, and Jones in 1947.